RESERVED TICKET PRICES: $275, $165, $99.50, $59.50, $29.50. The Freshen Up tour is Paul’s first outing following the release of his brand new studio album, Egypt Station, released September 7th on Capitol Records and generating rave reviews: Rolling Stone has raved, "Macca keeps adding new gems to his songbook, with nothing to prove except he’s the only genius who can do this… And, oh yeah — in his spare time, he happens to still be the greatest live performer on Earth,” while Entertainment Weekly described the album as "the still-vital life force of a superstar who has been there and everywhere and is glad just to be here now." 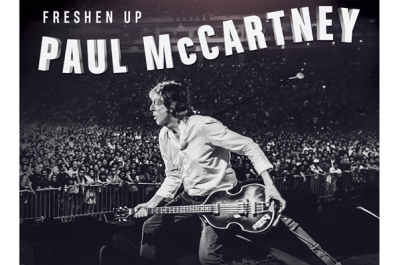 The Paul McCartney live experience is everything any music lover could ever want from a show: Nearly three hours nightly of the greatest moments from the last 50 years of music, dozens of songs from Paul’s solo, Wings and of course Beatles catalogues that have formed the soundtracks of our lives. Paul and his band have played an unparalleled range of venues and locations throughout the Americas, the UK, Europe, Japan, Australia, New Zealand and all points between: outside the Coliseum in Rome, Moscow’s Red Square, Buckingham Palace, The White House, a free show in Mexico for over 400,000 people, the last ever show at San Francisco’s Candlestick Park where The Beatles played their final concert in 1966, a 2016 week in the California desert that included two headline sets at the historic Desert Trip festival and a jam-packed club gig for a few hundred lucky fans at Pappy & Harriet’s Pioneertown Palace, and even one performance broadcast live into Space! Featuring Paul’s band of the last 15+ years - Paul “Wix” Wickens (keyboards), Brian Ray (bass/guitar), Rusty Anderson (guitar) and Abe Laboriel Jr (drums) -and constantly upgraded state of the art audio and video technology that ensures an unforgettable experience from every seat in the house, a Paul McCartney concert is never anything short of life-changing.